Are you ready for the details on my laundry basket dressers? I think this might be my favorite thing I've ever made. It's life changing to have somewhere for the clean laundry!! I've only been using the basket dressers for a few days but I'm totally in love. That is a lot of raving about LAUNDRY but I'm sure those with lots of kids understand how fast you can get behind. I am so excited that Ana was nice enough to write a plan for the 4 high dressers that I built! So check out the plan and I'll show you the steps I followed to build it. I had my two biggest pieces cut at the lumberyard so it would fit into my van. The other pieces were cut on the table saw at home. I have a little lumberyard that I go to and they are SUPER helpful. I just take my plan in and show them what I am making and they give advice on woods and will cut it and load it into my van. If you are having the store cut your wood show them what you are building and what the cut directions are. Then MEASURE YOUR WOOD before leaving the store to make sure it's right. My other big cutting tip is to remember that you can't measure all of the board at once because you have to take into account the width of your blade. Measure, cut, measure again....cut again. 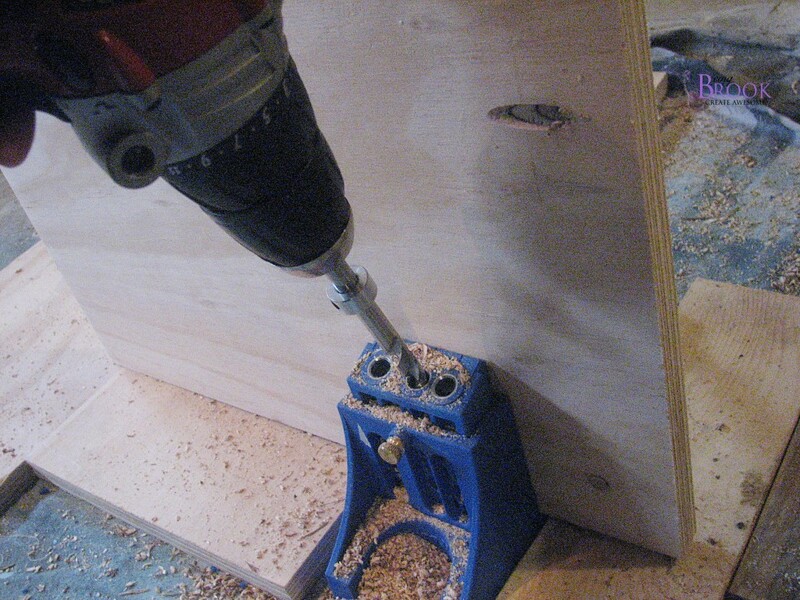 Then I used my kreg jig to drill all the pocket holes into all the back pieces and the tops/bottoms of the side pieces. LOVE the kreg jig. My husband usually helps me with projects but since I bought this handy tool I've kicked him out of the garage. It makes assembling the furniture so much easier. I did my dressers assembly style. 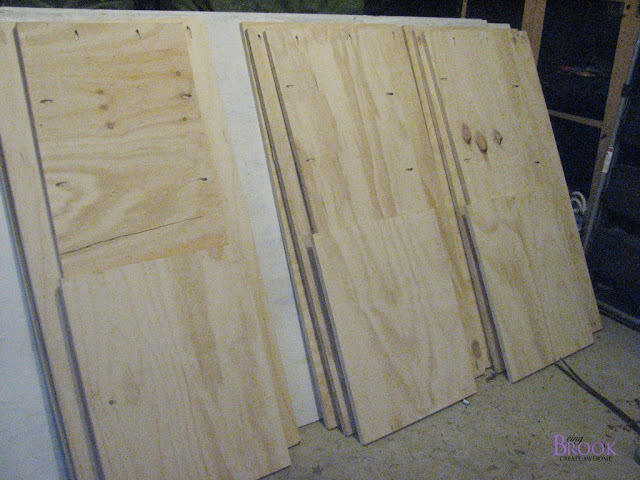 Here's all the wood cut and with the pocket holes drilled. I primed all the pieces with Zinsser 123 Primer. I prime almost everything and it really does help the paint adhere better and give you a smooth finish with less top coats. In the plan Ana wrote she attached the 1x2's before assembling so you would want your 1x2 rails attached before painting. I found it much easier to paint all the flat pieces before assembling with a roller. Way less time then trying to paint in the crevices. 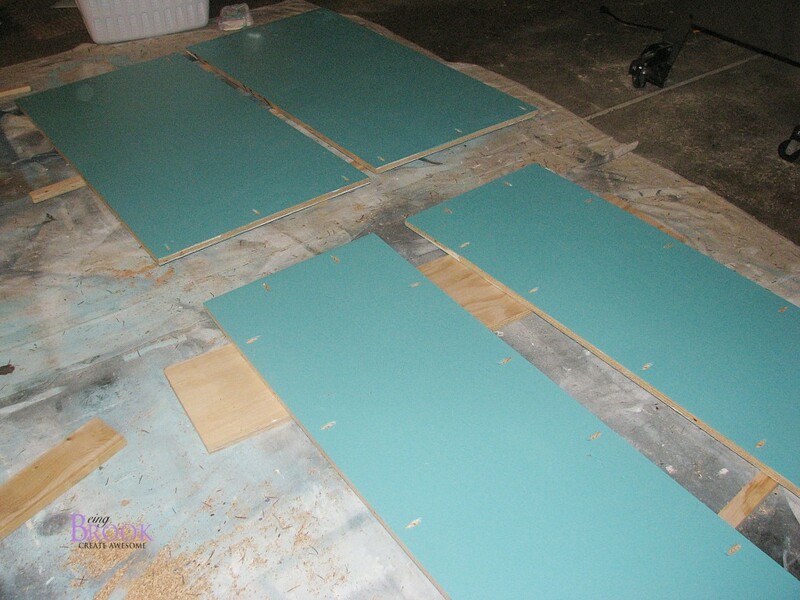 Then I used Behr's Teal Zeal to paint the topcoat. Then I assembled the dressers. The pieces are really heavy so it is much easier to have someone there holding it up while you screw it together. You could use iron on edge banding to finish the edges. I decided to just paint mine. I come from a whole family of accountants so I always want to know what things cost. So here are the details. $10-1x2's. 75 cents each at Home Depot. $105-Plywood. I used AC plywood from my local lumberyard it was $35 a sheet. 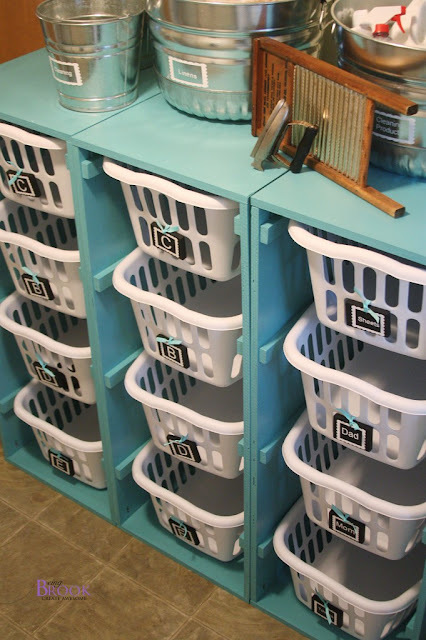 $196-Total for three laundry basket dressers and baskets. 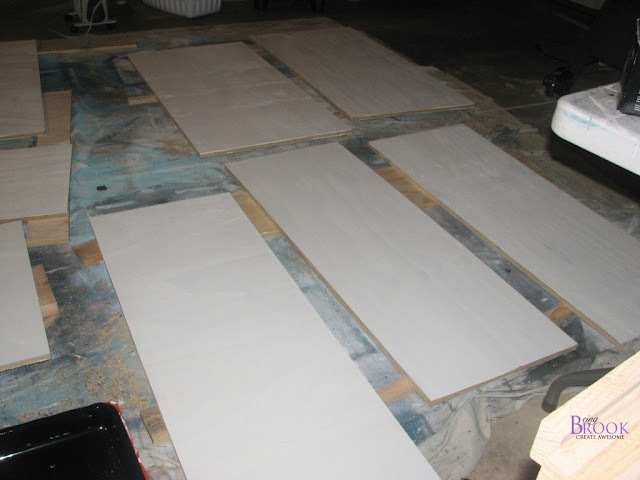 I still have lots of paint and primer leftover for other projects. 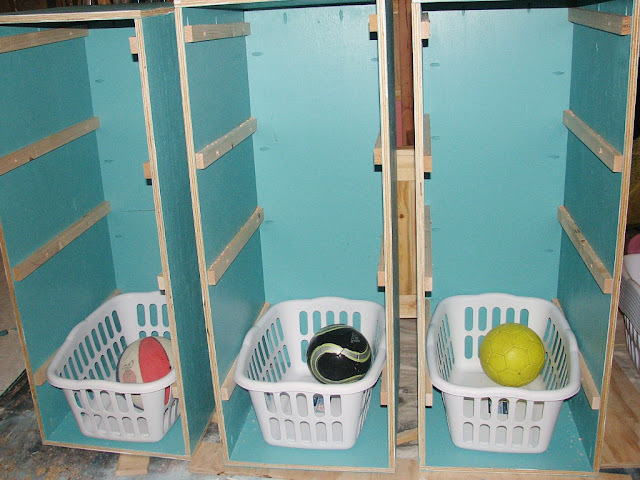 I would guess that it would cost about $50-75 to make one dresser because you wouldn't need a whole gallon of paint or primer and a lot less baskets! The metal buckets on top are from a farm supply store. 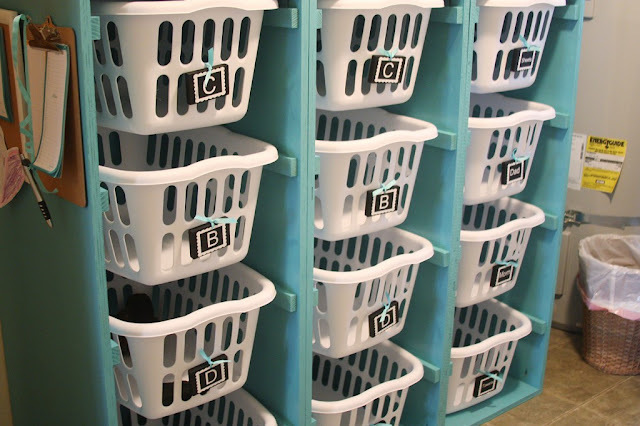 So excited to have my clean laundry in baskets instead of in a giant pile on my bedroom floor! 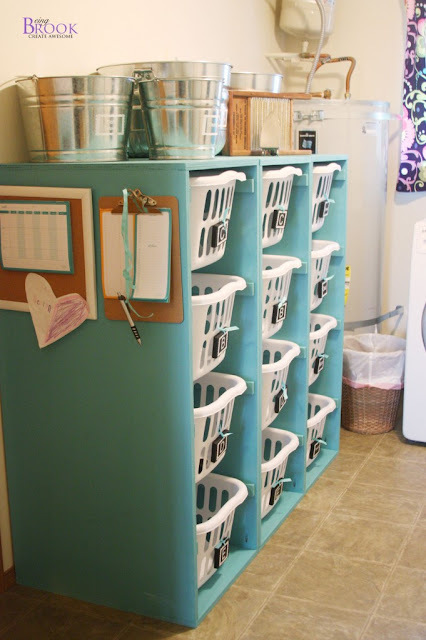 You can also check out how I organize the laundry room!